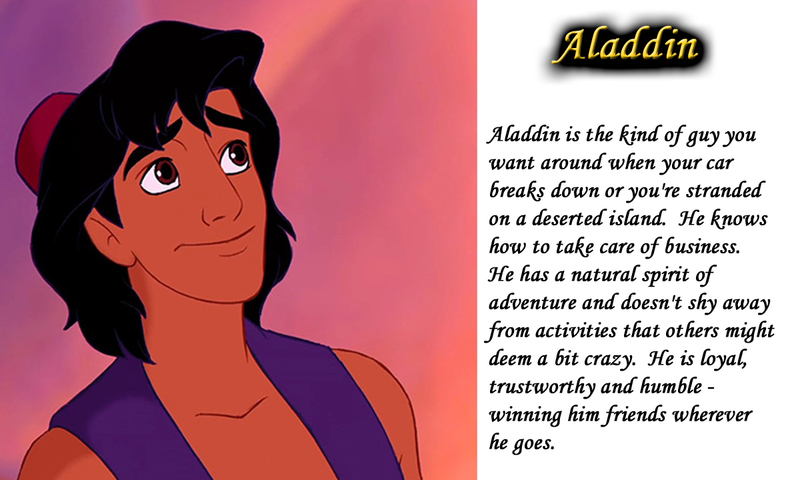 Aladdin is the kind of guy you want around when your car breaks down or you're stranded on a deserted island. He knows how to take care of business. 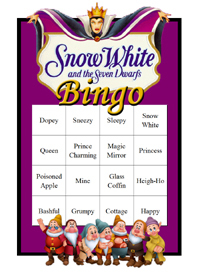 He has a natural spirit of adventure and doesn't shy away from activities that others might deem a bit crazy. 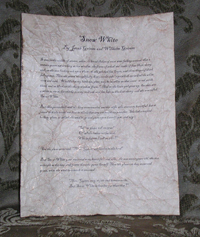 He is loyal, trustworthy and humble - winning him friends wherever he goes. 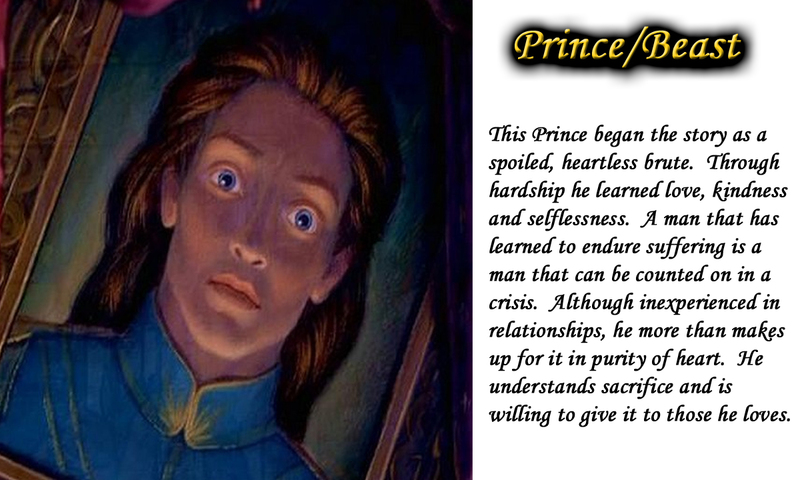 This Prince began the story as a spoiled, heartless brute. Through hardship he learned love, kindness and selflessness. A man that has learned to endure suffering is a man that can be counted on in a crisis. 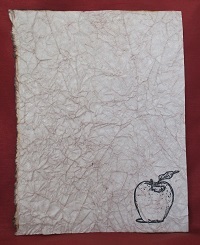 Although inexperienced in relationships, he more than makes up for it in purity of heart. He understands sacrifice and is willing to give it to those he loves. 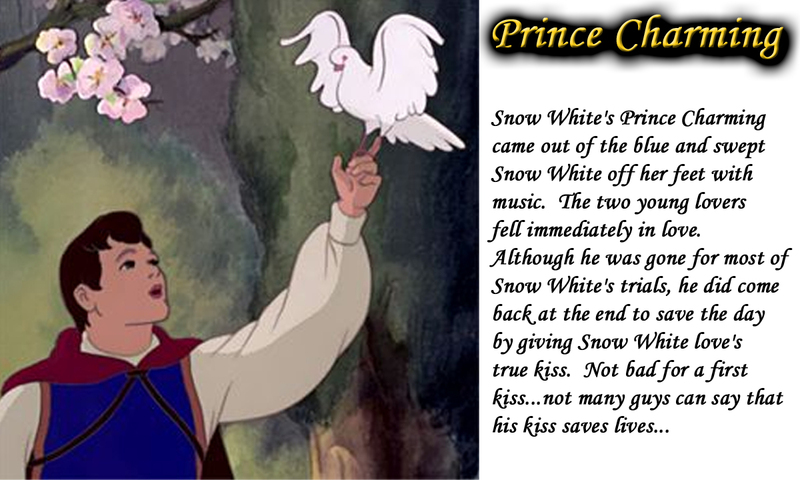 Although we don't know a lot about this Prince from the Classic Disney movie, we can say that he knows how to fall in love at first site. After just one look and a dance, he's ready to pop the question. He would seem to not fall to the distractions of love otherwise. 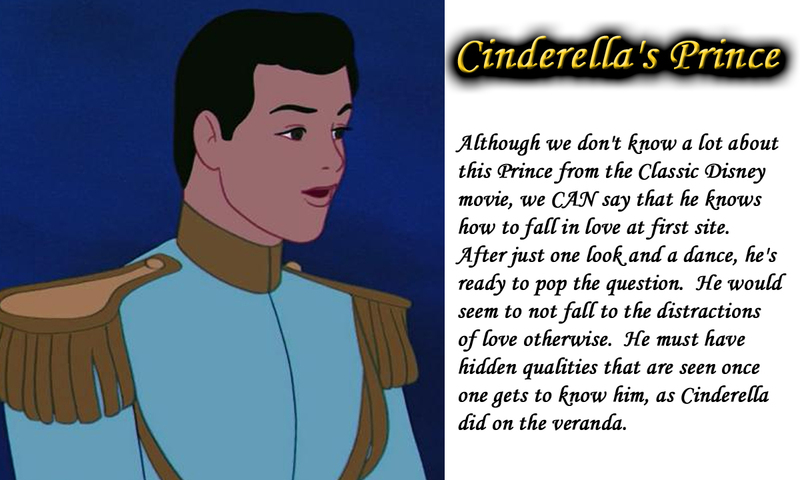 He must have hidden qualities that are seen once one gets to know him, as Cinderella did on the veranda. 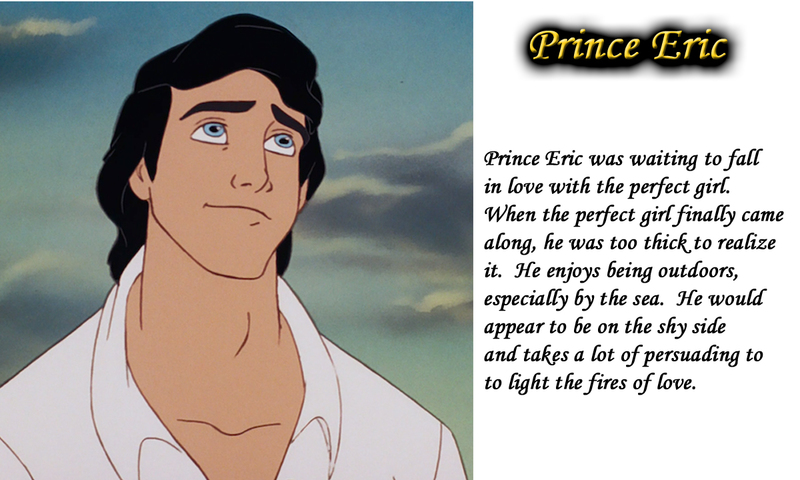 Prince Eric was waiting to fall in love with the perfect girl. When the perfect girl. When the perfect girl finally came along, he was too thick to realize it. He enjoys being outdoors, especially by the sea. 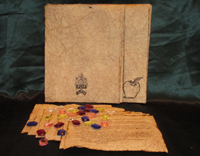 He would appear to be on the shy side and takes a lot of persuading to light the fires of love. 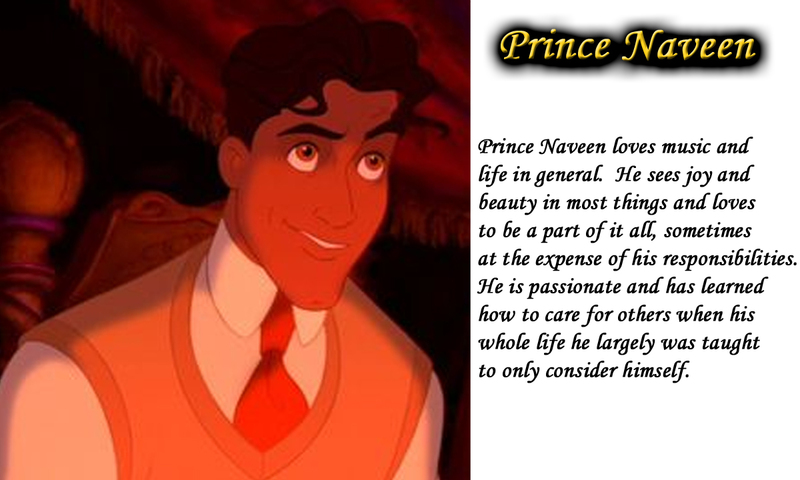 Prince Naveen loves music and life in general. He sees joy and beauty in most things and loves to be a part of it all, sometimes at the expense of his responsibilities. He is passionate and has learned how to care for others when his whole like he largely was taught to only consider himself. Prince Phillip was a confident young man who didn't hesitate in any situation - no matter the risk or danger. 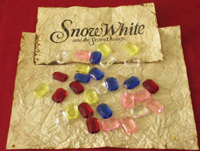 He wooed the Princess even when she turned his advances away. He just smiled and kept grabbing her hand. He faced more valiantly faced a dragon in true storybook form. He didn't care much for public opinion, either. 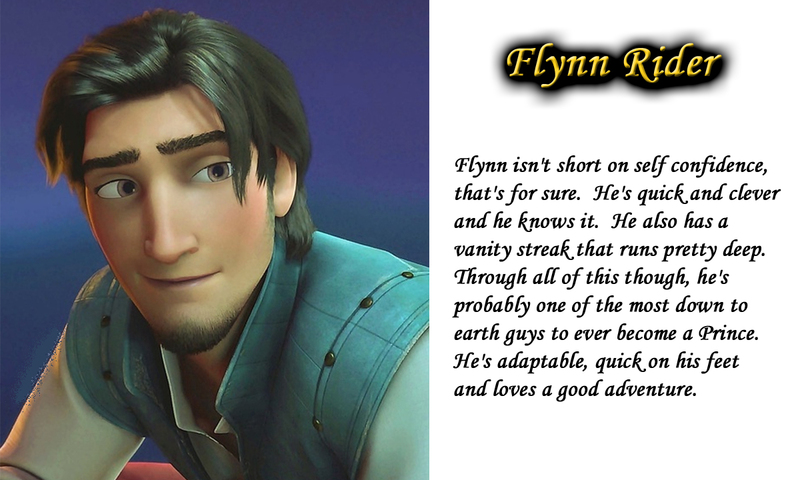 Flynn Rider isn't short on self confidence, that's for sure. He's quick and clever and he knows it. He also has a vanity streak that runs pretty deep. 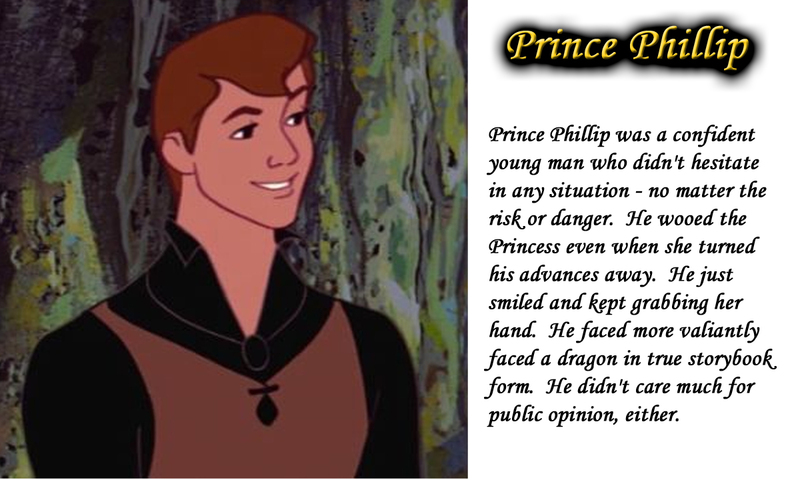 Through all of this, though, he's probably one of the most down to earth guys to ever become a Prince. He's adaptable, quick on his feet and loves a good adventure.